Click HERE for a free bag tag from Nursery Water. Nursery Water will be giving away 100 per day, while supplies last. 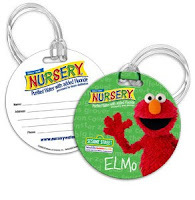 The tag features Elmo on the front and a place to write your Name, Address, and Phone number on the back. When we travel, I make sure to have a bag tag on each piece of luggage just in case anything gets lost. Since we now need to pack baby gear, this will be a great addition to one of the new bags!